Interest Offset Mechanisms are a facility where two or more bank accounts are grouped for the purposes of charging interest. On a daily basis, the Bank’s computer combines the cleared balances of these accounts, and accrues interest (at a pre-agreed lending rate) to this net balance. Interest Offset Mechanisms are typically available to two or more current accounts, which are either in the same business name or in the names of related companies. Certain company law requirements must be complied with, before an offset can be implemented between two limited companies. Interest Offset Mechanisms must not be assumed to be in place. In many instances, Irish banks will not unilaterally volunteer to set one up unless instructed by the client. A typical Standard Lending Term involves offsetting between two or more current accounts, at a standard rate of 1 per cent. It is less common for offsetting to take place between a current account and a loan account. 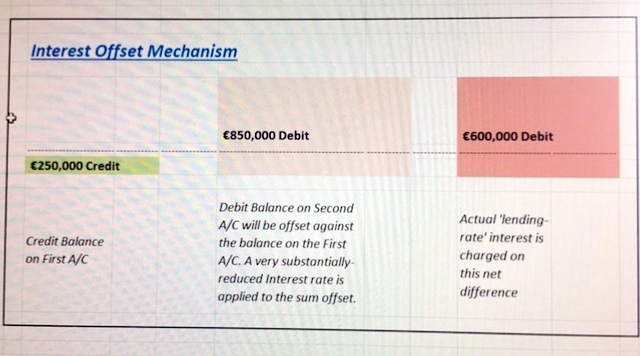 Some banks claim not to provide Interest Offset Mechanisms to client facilities in any circumstances, while others allow only a limited offset – for example, up to a certain debit balance threshold. Some banks can, in the right circumstances, implement Interest Offset Mechanisms between current accounts held in different branches of the same group. not-for-profit sectors, including the public sector and charities. the current accounts of its retail outlets and its subsidiaries, which perhaps sell through more than one dealership. If a Client runs a sizeable company in the motor sector, the bank’s willingness to set in place cost-effectively structured Interest Offset Mechanisms will be influenced by an analytical review of the company’s financial & trading profile through an examination of its audited financial statements in tandem with other salient aspects. The interest rate within Interest Offset Mechanisms is the rate applied by the Bank on the funds that have been offset. 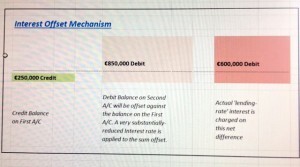 A standard offset interest rate may be negotiated either upwards or downwards, depending on the scale of the commercial relationship between the customer and Bank. For example a Dealer in the Motor Sector may have a large block of asset financing business placed with the leasing subsidiary of a Bank Group. This would form part of the negotiations if the Motor Group was seeking cost-efficient Interest Offset Mechanisms. The lack of Interest Offset Mechanisms – or even incorrectly implemented Interest Offset Mechanisms – can be a major profit driver for Banks in general. For large corporate and commercial Bank clients, the most strategic approach would be to commission a professional estimated bank profitability audit on the relationship with their Bank, to assist in achieving optimal Interest Offset Mechanisms.